The Irish Farmers' Association is opposing the sale of an active farm in Co Meath by so-called vulture fund firm Cerberus Promontoria, which acquired a loan secured on the land from Ulster Bank less than two years ago. The farm organisation says the farm family is willing to implement a credible debt solution and said it will ensure that if the land is sold by the fund then farmers will refuse to co-operate with whoever buys it. This they said will effectively render the land useless to any outside buyer. The IFA says up to 2,000 farmers around the country are in serious difficulties over debt and wants them to be given more time to deal with their debts in order to keep their farms intact. 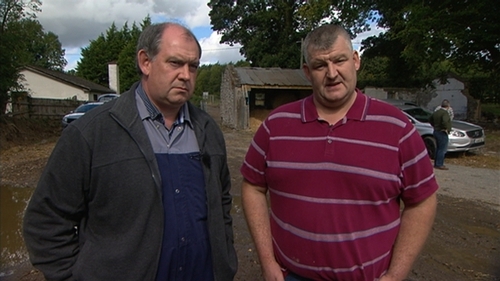 Brothers Gerry and Michael McCann learned two weeks ago that the 38-acre farm holding that they paid over €1m for in 2008 had been listed for auction on the BidX1 property site without their knowledge. The auction is scheduled for Thursday 20 September. The farm is being advertised as a vacant possession despite the fact that 39-year-old Michael McCann has a very active goat milking operation on the land and sleeps over on many occasions in caravan located on the farm. The IFA has said Promontoria should not be allowed to sell the farm out from under the brothers in this fashion because they have offered a credible alternative plan to deal with the debt. The farm organisation has been working closely with the McCanns to engineer a debt solution for some time and they are satisfied that the brothers have been honourable and straight in trying to deal with the debt. This morning the IFA erected posters and notices outside the McCann’s farm warning potential buyers that this is a forced land sale and as far as the farming community is concerned the land is not for sale. Martin Stapleton, Chairman of the IFA’s Farm Business Committee, issued a warning that if someone were to buy the land the IFA would ensure local farmers would refuse to co-operate with them. This, he said, would effectively render the land worthless to any potential buyer. Mr Stapleton also said there are about 2,000 farm families around the country who are in serious difficulties over debt and that attempted forced sales like the McCann’s look set to become more common in the months and years ahead. The financial trouble the McCann’s are in dates back ten years to 2008 to the height of the boom. Gerry McCann, who is now 45 years old and is the eldest of the brothers, had a furniture manufacturing business off-farm which was going very well. Farming was also doing well. Land prices extremely high. It was the era easy credit and banks were keen to dole out larger and larger amounts to borrowers. The McCann brothers hail from a nearby farm where their 80-year-old father and other brother PJ still farm. When the 38-acre farm that was previously owned by their father’s cousin came up for sale they wanted to buy it. The €1,050,000 price they had to fork out to secure the farm was astronomical, especially by today’s standards. Almost €800,000 of that money was borrowed by the brothers from Ulster Bank. In order to get the money from the bank the McCann’s father - who was 70 at the time - had to offer 20 acres of land across the road from the new holding as security for the loan, and he also had to sign a personal guarantee for the debt to ensure his sons could secure the loan. Gerry McCann says his furniture business hit hard times in 2010 and it was then that the bank loan for the farm began to fall into arrears. He said that they had managed to reduce the outstanding debt to about €650,000 before it all started to fall apart. Since then, however, arrears and penalty interest rates have driven the outstanding debt back up to exactly where it was at the beginning at around €800,000. In order to satisfy the bank Michael McCann sold his family home, clearing €80,000 in funds which he immediately used to pay off the debt. Gerry McCann says he then remortgaged his own home, raising another €150,000 which also went towards the debt. In addition the brothers sold a site on the farm for building and handed over the proceeds of that to that bank towards the debt. Between all the repayments they made as well as the lump sums they contributed from house sales and remortgaging Gerry says the McCann family has already paid back almost €500,000 to Ulster Bank. Yet their debt level today stands pretty much exactly where it was on day one at nearly €800,000 and Cerberus Promontoria has triggered the sale of their farm. The fund have also listed the 20 acres of land the McCann’s father put up as security for the loan in 2008 for sale. The brothers say nobody from Promontoria told their father his land was being sold. The BidX listings suggest Promontoria would accept €250,000 for the 38 acre farm and €160,000 for the 20 acres the father offered as security. That is a total of €410,000 which is far short of the €800,000 the Promontoria is still demanding from the McCann brothers. The IFA say they have worked out a plan which would see the McCanns sell significant assets and make certain payment commitments to Promontoria, all of which would be enough to pay off 65%of the debt owed. They point out that it is less than two years since Cerberus Promontoria bought the loan portfolio from Ulster Bank at a knock down rate of 35 cent in the pound. The farm organisation says that if Promontoria accepted the new deal they are offering and enabled the McCanns to continue farming they would still be getting double the amount they paid Ulster Bank for the McCann loans less than two years ago. That they say would still represent a fantastic return on their original investment. The McCann’s and the IFA are now extremely concerned about what Promontoria is going to do next. The IFA says it has not yet given up hope that Promontoria will call off the land sale next week and accept its latest debt repayment proposal plan offered on behalf of the McCanns.